Summer read … more like life read! But, definitely read this this summer on a plane, by a pool, at the beach, anywhere you are – read. this. book. 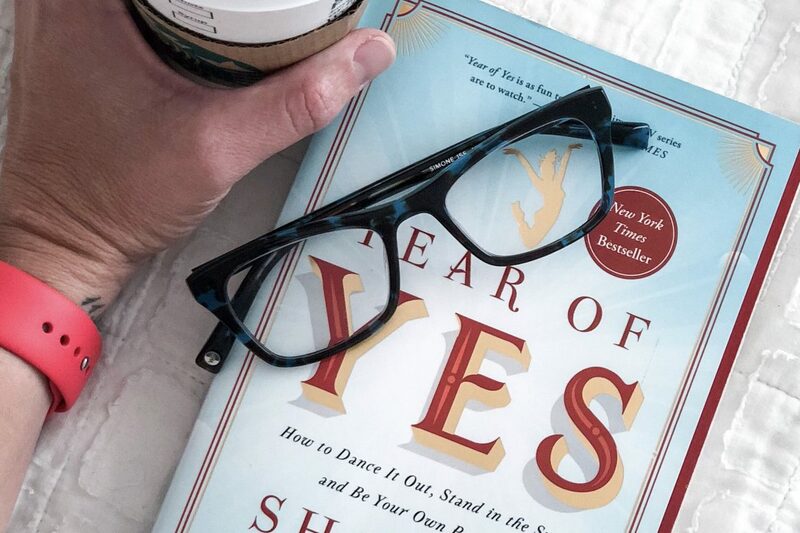 Year of Yes has been on my book shelf for a few months and I just kept picking a different book. Books that seemed to hit home harder. Read more easily. Cover a topic more fun. I picked books with bright covers and pretty pictures and snappy titles. I don’t know what was preventing me from selecting Year of Yes, but I am so glad I finally picked it up and dug in. I have been a Grey’s Anatomy fan since the start. Who doesn’t love a show with an incredible soundtrack. I am all about a good music montage and music that speaks to me. The Postal Service, Tegan and Sara, Get Set Go, Ben Lee, The Fray, KT Tunstall, Gomez, Kate Havnevik, Snow Patrol. You get the point. I loved everything about Grey’s in the early days. McDreamy, McSteamy, Denny Duquette, dark and twisty, dancing it out. From 2005 – 2010 every single Thursday night was dedicated to Grey’s. And then life happened and for some reason Thursday’s were filled with momming, living, happy hour and date nights. And Grey’s took a back seat. But, you see, I heard about Shonda Rhimes and I loved the words she breathed into her characters. Of course her book would be written beautifully. And obviously I am joining this reading journey a bit late as this book was published in 2015. Hello, it is mid-2018. I am late to this party. But, here is the thing. You need to join this party. Yep, there, I said it. You need to join this reading party. This book is fabulous. I mean fabulous. Shonda Rhimes has a way of breathing laughter and life into her story. I mean, it’s her story, so there is already life. But, the laughter around things that have been hard for her. Self deprecation. The ability to also state truth. It read so easily and so free. It was smart and witty and strong. It was her story and I loved reading it. And here is the selfish part of why this book was so incredible. Because Shonda gives us, the reader, permission to say yes to ourselves. You see, in her own journey of saying yes, through her own story, she gives us permission. Through all of her yes’, she is telling the reader that we must say YES to ourselves too. That saying yes to ourselves is in fact the greatest gift we could give ourselves. What’s more, she bluntly lets the reader in on a little secret, those things we are discontent with right now – being over weight, not living our best life, being a doormat to someone, not following our true career path, etc. – we are saying yes to the mediocre, to the less than ideal path we are on. So, what yes do we want to be saying to ourselves? Me – Yes to healthy. Yes to ruthlessly honest. Yes to confidence. Yes to happiness. Yes to doing the work that makes the dream come true. Yes to saying no. Yes to saying yes. Yes to living as my vibrant self. Yes to being wholly me and unapologetically me. Yes to learning more. Yes to being more. Yes. yes. yes. Need a spark, read this book. Need a laugh, read this book. Need moments of clarity, read this book. Need a break from everything else, read this book.